As seen on CBS Evening News with Katie Couric, Dr. Scharmaine Lawson-Baker is a nationally recognized and award-winning nurse practitioner in New Orleans, Louisiana. 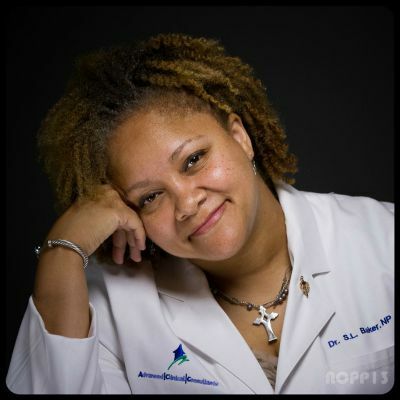 She is a fellow of the American Association of Nurse Practitioners (AANP), and winner of the 2013 Healthcare Hero award (New Orleans City Business magazine) and 2008 Entrepreneur of the Year award (ADVANCE for Nurse Practitioner magazine). Dr. Baker has always loved to write and is excited to share new stories with a broader base of friends, colleagues, and family. Dr. Baker, NP has received numerous honors and awards for her contributions to healthcare in New Orleans since she became a family nurse practitioner in 2000. Dr. Lawson-Baker was inspired to make house calls while caring for her grandmother, who was ill and needed an in-home doctor. She serves a large geriatric population in the comfort of their private homes, group homes, or assisted living facilities. After Hurricane Katrina, Dr. Baker was instrumental in caring for the sick and disabled in New Orleans, where hospitals had closed and doctors had evacuated but never returned. Her patient load went from 100 to 500 in only three months. Her passion and unwavering dedication to caring for homebound patients in her home town which is what prompted the interview with Katie Couric. Nola wants to be a nurse practitioner just like her mom. She has learned how to care for people of all ages and now visits her friends to heal their sick baby dolls. Along the way, she learns more about her culturally diverse world. 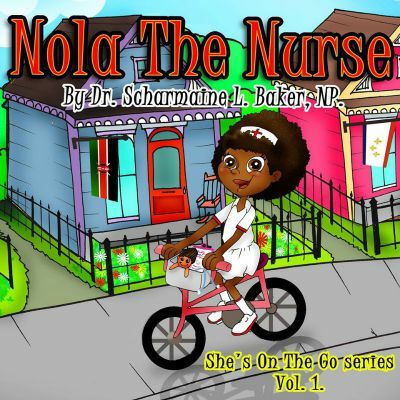 Nola the Nurse was born from the desire of Dr. Scharmaine L. Baker, NP who had been searching for children’s books that were both culturally sensitive and featured African-American nurses. She had found none, so she decided to create her own and Nola the Nurse was born. Nola the Nurse, She’s On The Go, is the first in a series of beautifully illustrated bedtime stories, perfect for young children. Your child will delight in the colorful pictures and will also learn important cultural lessons. In this special edition to the Nola The Nurse, She's On The Go series: Nola remembers the story of Hurricane Katrina as her mother, Dr. Eden NP, told it to her. Nola vividly shares the details of the worst natural disaster to ever hit the United States. Her dolls and other toys are instantly transformed into Nola's account of the storm as she tells the story of how her mother and Dr. Baker, both nurse practitioners, came back to New Orleans to provide care to many storm victims. The information in these pages will either excite you into beginning that house-call practice right away or scare you into keeping your day job. Either way, I'm glad you've chosen to learn about my happiness with beginning a house-call practice and to learn from my struggles to maintain a business in the nation's current health-care state. Are you looking for a step-by-step guide on how to start a house-call practice? Are you looking for a few examples from an expert in the field of house calls to help guide your decision making? If you've answered yes to these questions, this is the book for you. Making medical house calls is an extremely rewarding and profitable niche practice that can be started with little or no overhead. If you already love or think you will love going into the home setting to provide primary care when health care is often scarce or unavailable, this is the field for you. This book is written with nuances and scenarios of a house-call practice for an advanced practice nurse, but if you are a physician assistant, physician, or any other practitioner looking to begin a housecall practice, there is plenty of information here for you too!